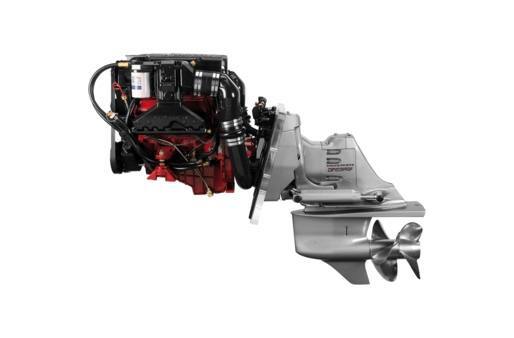 Volvo Penta Aquamatic Sterndrive V6‐280/DPS is a totally integrated package, powered by the 6‐cylinder, 4.3‐liter, freshwater‐cooled, direct‐injected gasoline engine. Working together with the perfectly matched DPS Duoprop drive, this package offers excellent handling, and impressive acceleration power. Compact and lightweight package: The compact engine-drive package facilitates installation. Thanks to the aluminum cylinder block and cylinder head, the low-friction, lightweight pistons, and a cast-aluminum oil pan, the power-toweight ratio is excellent. Direct injection technology: The direct injection fuel system enables high compression ratio with more energy coming from each drop of fuel - thus reducing both fuel consumption and emission levels. Variable valve timing: With the variable valve timing, each movement of the intake and exhaust valve can be optimized for speed and load. Combustion will always be correct irrespective of rpm, resulting in higher torque and acceleration across the whole rpm range. Freshwater-cooled engine: The freshwater cooling system makes the engine last longer and run better. The closed-loop system eliminates seawater exposure inside the engine, prevents corrosion and improves the engine's durability and resale value. Easy Drain system: With the Easy Drain system, the engine is drained from raw water in just minutes. Thanks to the anti-siphon valve, this is possible with the boat still in the water.